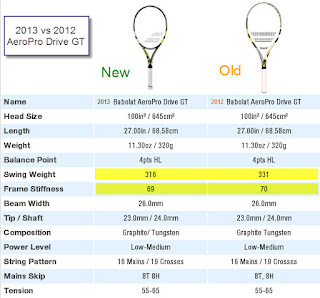 We've been granted a hands-on preview of Rafael Nadal's latest racket of choice, the Babolat AeroPro Drive GT! The live test was filmed before this racket was made available to the public. Our tennis fans got a sneak peak at the Best-Selling Tennis Racket line ever in the USA. See HD Pics of AeroPro Team and Lite versions. Our Review of the Babolat AeroPro Team and AeroPro Lite versions. It offers an exceptional blend of maneuverability, stability and all-around playability for wide range of improving players. This "tweener" class or "between Intermediate and Advance" levels fits a majority of players between the NTRP 3.5-4.5 skill levels. As with most Babolat rackets, it helps to have a medium to long, fast swing speed to take advantage of all maneuverability in these aerodynamic frames (Aero). It can generate fast racket head speed more easily than other rackets, and actually feels surprisingly light (compared to other rackets) when you're swinging it. The racket's ease is due to its lowered "swing weight" - which was dropped from 331 down to 316, in its current form. Also for 2013, it has been updated with Babolat's "Active Cortex" feature for more comfort on impact, it also feels slightly stiffer than previous years' models but a bit more control on mis-hits. TennisTopia (Rockville, MD) - one of the Largest *Babolat Authorized Resellers* on the East Coast! VIP Tip: Call ahead 301-230-9195 or email: info@tennistopia.com and mention "Tennis Bargains Promo" to reserve one first, with free stringing. SEE all our Sneak Peak Photos below!! Strung weight: 11.3 ounces strung. Headsize: 100 square inches. Standard length of 27 inches. Note:The AeroPro GT+ (Plus) version offers slightly more power and lighter frame with a 0.5 longer length. Babolat is the company that has been called the "Apple of Tennis Rackets"...and the AeroPro is their most popular tennis racket model. They will sell like hot cakes, so pre-order today! *Call for Demo Reservations at Tennis Topia! 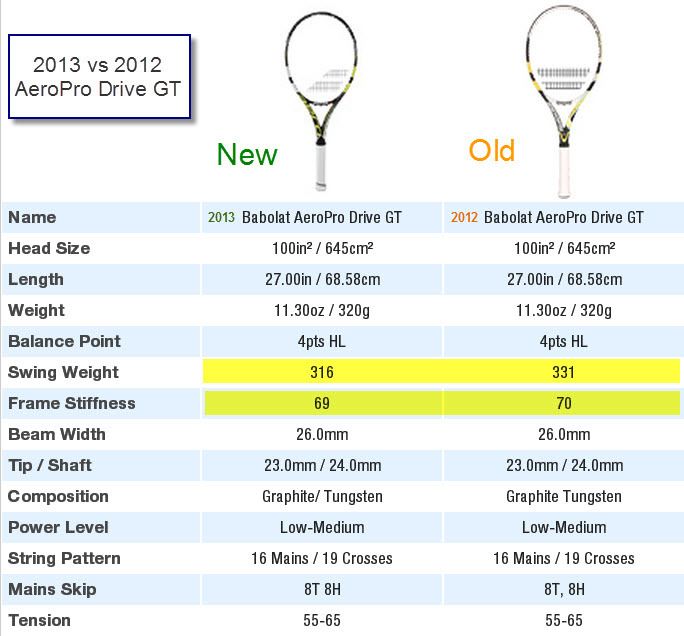 We also have a Review of the latest Babolat AeroPro Team and AeroPro Lite versions. For optimal performance, we recommend you string this racket with RPM Blast and VS Gut to balance out the stiffness in the frame; this hybrid offers maximum spin and comfort. Either with RPM in the Mains for durability or VS Touch Gut in the mains for top notch feel/touch.